Shek, A., Lacewell, D., Selle, A., Teece, D., Thompson, T. ACM SIGGRAPH Talks 2010. Abstract: We designed a system of authoring trees based around a language of hierarchical curves. 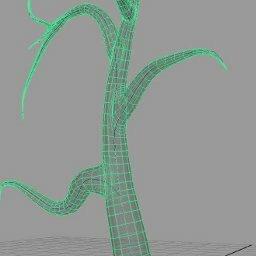 Our system lets artists interactively sketch out a base skeleton representation of a tree and grow procedural twigs and leaves out to a canopy shell by tweaking a limited number of parameters.